Often, the solution for a persistent pest problem is a combination of professional pest control in Fort Worth and preventative pest management. No homeowner cares for a pest problem, but it is especially important to effectively control them when family members experience allergies. Cockroach saliva, droppings, and cast-off exoskeletons are known factors that trigger allergies and worsen symptoms. Cockroaches are one of the most common triggers for those with allergies and asthma. If your home has a pest problem, contact The Bug Dude, we will take care of the problem with effective pest control, and assist you with tips for preventative pest management. Preventative pest control has been proven to reduce the number of days sick from allergies due to cockroaches. Children are especially sensitive to the allergies triggered by cockroaches, with one in five children testing positive for an allergy to cockroaches. Together with professional pest control in Fort Worth, your family will be healthier and the risk of disease from the pests eliminated. Children in homes being treated for cockroaches experience an improvement in their health, and less complications related to allergies. If you have a cockroach infestation, contact The Bug Dude today to schedule service. We recommend being proactive in your approach to the pests, before, during and after treatment. • Seal all cracks and gaps around your home’s exterior, including the foundation. This includes around doors, windows, in siding, and place screen wire over vent pipes. However, use approved high temperature wire for vents that exhaust heat, such as a gas water heater and the gas furnace. • Keep kitchen counters, the dining table and floors clean of drink, food and crumbs. Periodically move kitchen appliances and clean under them to remove any potential food source. • Provide regular vacuuming of carpets, rugs, drapes and furniture to remove cockroach debris. • Empty garbage cans routinely and dispose of in a tightly sealing trash can. • Repair water leaks in and outside your home. • Store nonperishable foodstuffs in tightly sealed containers. • A neat, clean house is less inviting to pests. • Check all bags and packages before bringing them into the home. • Do not leave pet food and water out overnight. • Cockroaches can produce a musty odor in your home when present in large numbers. If your home experiences this odor and no other cause can be determined by your plumber and HVAC technician, contact The Bug Dude for an inspection. • Schedule routine treatment of your home with professional pest control in Fort Worth. • Remove piles of paper and cardboard to avoid providing them with a handy home. There are approximately 70 species of cockroaches in the U.S. However, only a small number will inhabit homes. Three that commonly live in U.S. homes include the American cockroach, the German cockroach, and the brown-banded cockroach. Our dedicated professionals can take care of your cockroach problem with pest control in Fort Worth, year round. The American cockroach favors the habitat of food storage areas such as cabinets, pantry, basements, and sewers. They typically enter a home in shopping bags, often from bakeries, grocery stores, and restaurants. In addition, they will enter your home through the sewer pipe. Moisture from leaks, wet sinks and other sources are also an attraction for them and will contribute to their distribution in your home. These cockroaches develop wings when mature, and will fly. The German cockroach is distributed worldwide. They favor the warmer, more humid areas of the home such as the kitchen and bathroom. However, they may be found in other parts of the home if food and moisture are present. They also are typically brought into the home in bags and boxes. In addition, they are known for their ability to transmit disease from the pathogens E. coli, Salmonella and Typhus. They tend to reproduce rapidly and will require professional pest control in Fort Worth to get them under control. The brown-banded cockroach is one of the smallest of the cockroach species, and are distributed throughout the U.S. They require less moisture than the American cockroach, and due to this, can be found throughout the home. They prefer warmer temperatures and are often found in appliance motors, inside electronics, on ceilings, and other warm locations. Regardless of the species of cockroache in your home, we can provide the professional pest control in Fort Worth that you require to eliminate the problem. Cockroaches are typically nocturnal pests. When you see them during the day, it may may mean they were forced due to overcrowding. Unfortunately, this is a potential sign of a severe infestation, and professional pest control in Fort Worth is essential. Cockroaches will typically spend the day in cracks throughout your home out of sight. The treatment of a cockroach infestation may vary according to the species. For this reason, identifying the species in your home is essential. You can rely on the expertise of our professionals to identify and provide the treatment you require. In addition, we will identify potential locations of entry. Cockroaches are nasty pests that can spread disease and contaminate food. They can pick up disease causing pathogens as they crawl through contaminated material or sewage and transfer these germs to food or food preparation surfaces and kitchen utensils. According to the World Health Organization (WHO), they are proven or suspected carriers of the pathogens causing diarrhea, dysentery, cholera, leprosy, plague, typhoid fever and viral diseases such as poliomyelitis to name a few. 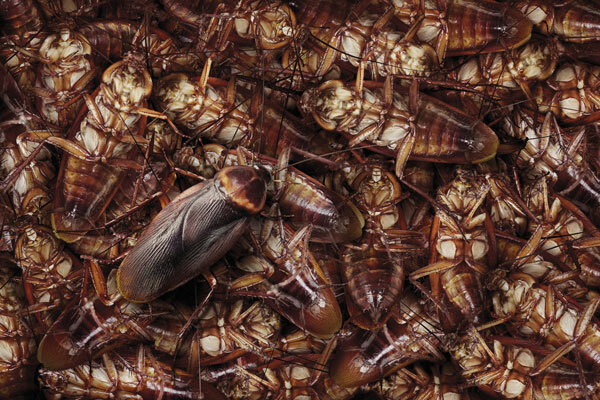 Do not risk your family’s health with a cockroach infestation, contact The Bug Dude today to schedule an inspection and pest control in Fort Worth. If you have concerns over cockroaches or other pests in your home, contact The Bug Dude for professional pest control in Fort Worth. Our pest control professionals serve Fort Worth, Dallas and the surrounding areas.